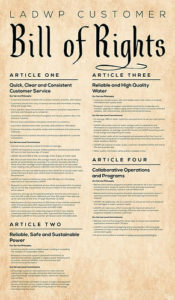 The City of Los Angeles Board of Water and Power Commissioners voted on Tuesday, January 17, to unanimously approve an initial version of the Los Angeles Department of Water and Power Customer Bill of Rights. The Commission also voted to extend the comment period for another 90 days to allow for stakeholders and Neighborhood Councils to provide input. 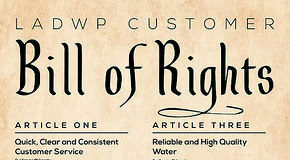 The Customer Bill of Rights will be revisited and possibly revised after the comment period closes. Comments can be submitted via email to [email protected]. Please join us for the next Infrastructure Committee Meeting on Tuesday, February 7, to discuss this policy and other Committee issues.